Just a quick follow-up from that Christmas Tree post from late last month. We found a tree! In the city no less. We had fully intended to drive out to the Fraser Valley to visit a tree farm and chop down our own, but it turned out that wasn’t really necessary. We found a small tree lot in a parking lot on 12th at Main, and brought home a Noble Fir. Our problem seemed to be that we tried to get a tree a bit too early. Apparently the tree lots open on December 1st, and not a moment sooner – nevermind that was a Monday this year, and we wanted to get the tree on the weekend. Oh well. As for the coloured vs. white lights dilemma – I like white lights, Neil likes multi-coloured. I’ve always felt it was a bit of a compromise to have the multi-coloured lights outside, and keep the tree white. But Neil was pushing for the coloured tree lights this year. Turns out frugality won out in the end, and we have both multi-coloured and white lights in the tree. Since we were about to move this time last year, we didn’t really decorate, so we had really lost track of what we have in terms of Christmas Decor. And when we pulled out the lights, we found we’ve got two strings of white lights that work, and one string of coloured. 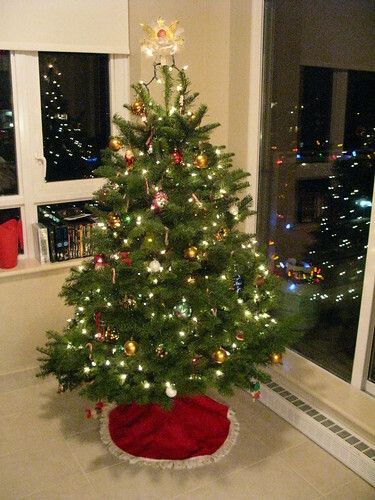 The tree needed 3 strings of lights, so the coloured went up the middle, and the white around the outside. And I’ve got to admit, the effect is quite nice! How about you? Have you got a tree up? What’s it look like? For our tree we go for sleek and sophisticated. To that end we have white, multicoloured, and my personal favourite, chili pepper lights. Designer series it is not. Fun? I think so. Our tree has been up since the 7th and its a gorgeous tree this year. I always go for the multicolored lights so its got multi-colored lights, a mish-mash of ornaments ranging from homemade kitsch to fancy, expensive store-bought. There’s an angel on top and a skirt on the bottom and lots of garland but no tinsel!! We have a tree up! It’s actually about 2/3rds of a tree because it wouldn’t fit in the corner if I put all the branches on… oh wait I already blogged about this. Anyways, we have one string of lights – they are multicoloured and attached to a little box which makes them flash in tune to the midi christmas carols it’ll play if you haven’t figured out how to TURN THEM OFF. We figured that out a few years ago and now can’t remember how to turn them on again, much to everyone’s delight. in front of the window! my mom and some from friends! Previous Previous post: ….You Must Swiff It!